Rare and choice; large rose form blush starts with a pale pink cast and fades to white, while crown retains light pink; center petals are edged with crimson; an incomparable classic beauty with fragrance to match; height to 36 inches; robust grower and prolific bloomer. (Calot 1856) A large fuchsia pink double with wide guard petals and a fluffy center; petaloids of paler pink in the center are interspersed with the other petals; about 33 inches tall; one of the last to bloom. (Krekler 1958) Light silvery pink double with even more silvery highlights as the bloom matures; the large flat blossoms are sweetly fragrant and dense with wide, round petals; deep green foliage with stems to 26 inches; forms a tidy mound. (Auten 1943) Rich dark purplish red double with wide guard petals; blooms have heavy substance and intense fragrance; plant height to 48 inches, so even with its stiff stems will likely need staking. (Seidl 1996) Loosely arranged bright rose pink petals give these 5 inch flowers a carnation-like appearance; strong spicy fragrance is released when the weather is warm; stems are 30 inches or more and width reaches 38 inches; forms a neat bush. 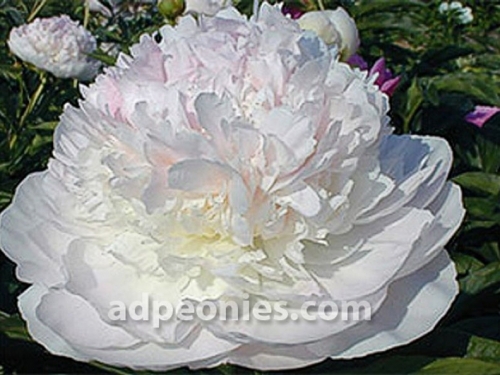 (Holland) Large frilly pink with layers of petals; strong rose-like fragrance; about 24 inches tall and a robust grower with strong stems; excellent cut, reputed to one of the most fragrant peonies. 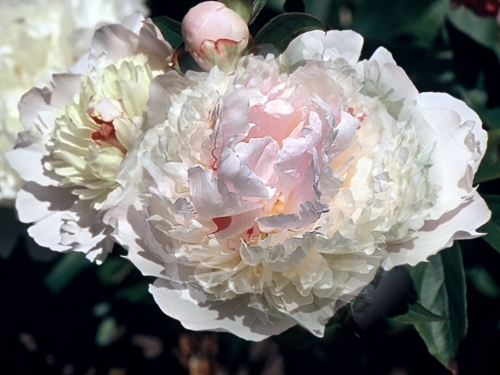 (Lemon 1924) One of the oldest peonies in commerce; medium-size to large blooms of silvery old rose pink; floriferous with several sidebuds; tall stems about 36 inches will need staking; blooms midseason in our Pacific Northwest climate; intoxicating fragrance, so, warning, don't sniff and drive. (Gombault/Dessert 1866) A globe of pink, salmon pink and cream petals, surrounded by large pink guard petals; some of the pink petals in the center show red edges; dazzling flowers are medium-size, but over years get very large; height to about 38 inches. (Van der Valk/ Van der Zwet 1952) Blush pink double with hairline red edges on some of its wide petals; when fully open it pales to a delicate shade of ivory pink with subtle yellow highlights deep within the bloom; lovely fragrance. (Sass 1932) A lavish pink full double that's an old fashioned delight; frilly petals of rich apple-blossom pink; superbly fragrant. 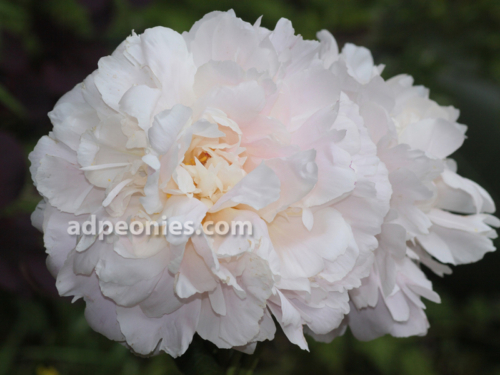 (Dessert 1913) French horticulturists at that time were very excited by Dessert's introduction of the first double peony to show some yellow; buds are pale pink, then as they open, assert a rich bright yellow cast before fading to creamy white; medium height. (Doriat 1927) A blush to white double fully packed with petals and perfectly formed; in the center smaller petals with a soft creamy glow makes a mound surrounded by the pure white of the larger outer petals; a superb peony for the garden as well as for the vase and said to be "the best white peony for cut flowers because of her white bud presentation, strong stems and very easy flowering"; all wrapped in a lovely fragrance.